Inside: The terrible twos is a stage of childhood many parents dread. With a perspective shift and the right strategies, you don’t need to just survive this fun childhood stage. You can love it, instead! 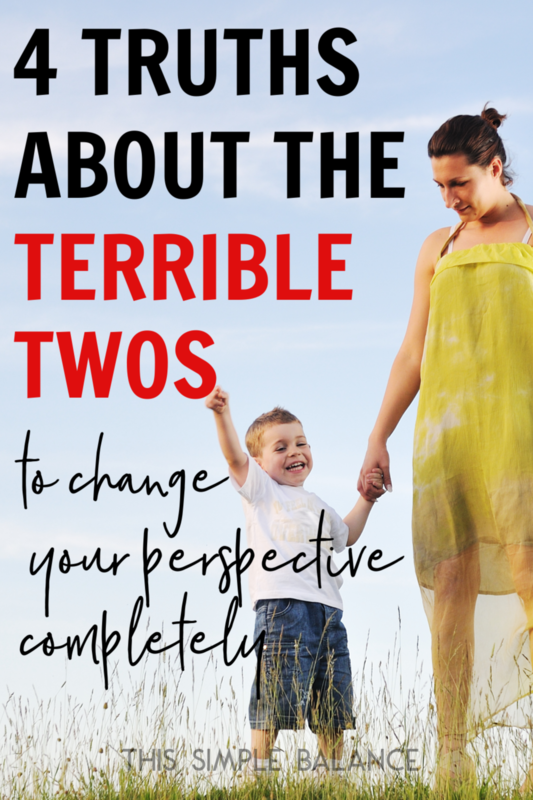 When I was a new mom, everything I heard about the terrible twos was negative. As you can imagine, this negativity drastically affected how I approached this phase of my child’s life. Before my daughter was even close to two, I was getting ready for battle and dreading the terrible twos. 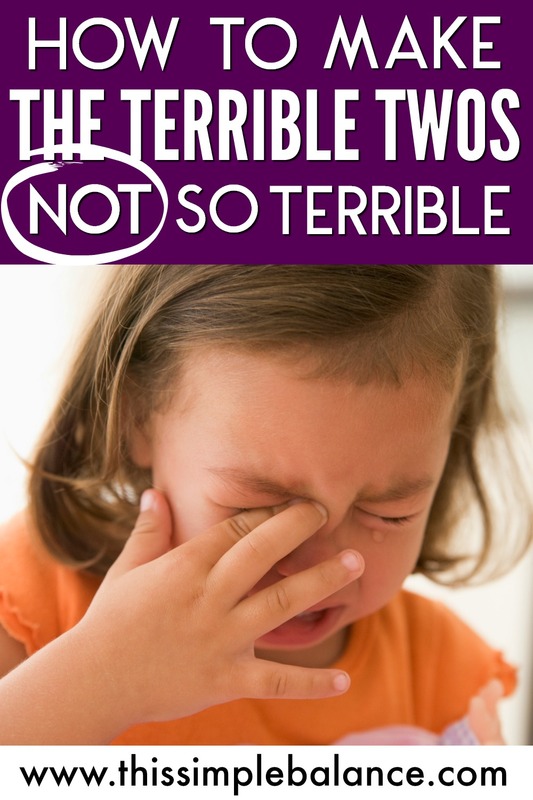 I expected the terrible twos to be what everyone said they were – terrible. There wasn’t any room in my mind for a different point of view. Thankfully, I’ve come a long way since my first child’s “terrible twos”. Now that I’m experiencing them the fourth time around, the twos is by far my favorite age. The more my friends confide in me about their struggles parenting teens, I say, “Give me potty training, tantrums, and sippy cups!” While I’m sure I will learn to love the teen years too, I’m loving the toddler years more and more. Don’t get me wrong, the terrible twos has its share of challenges, but no more than any other age or stage. 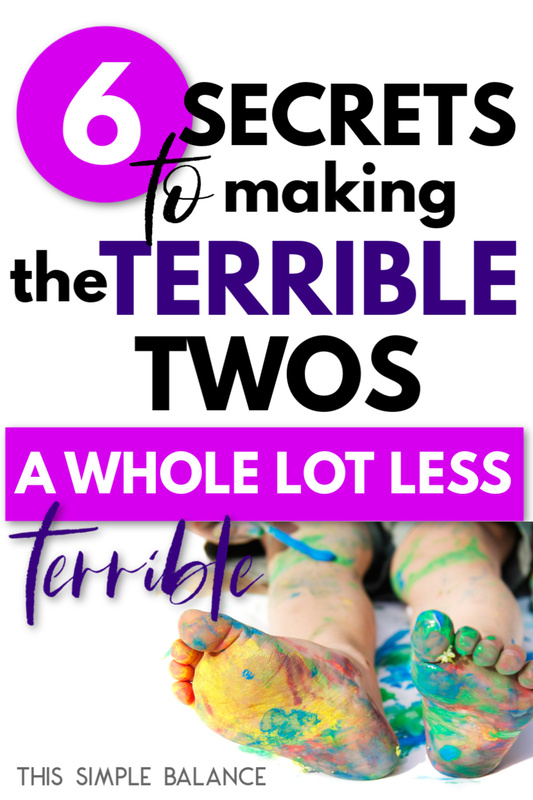 It turns out dealing with the terrible twos doesn’t need to be so terrible after all. You just need a perspective shift, with fresh strategies to match. There are four things you need to remember about two-year-olds, and the majority have to do with child development. For a long time, I was heavily influenced by the perspective that every two-year-old behavior that was unacceptable deserved punishment, usually spanking. Everything from playing with outlets to throwing a tantrum was a punishable offense, and punishment was for her protection and safety, to teach her to obey when it really mattered. Thankfully, I’ve learned a lot since then. What I realized after a LOT of reading was that much of what we consider unacceptable two-year-old behavior – from tantrums to exploring common household dangers – comes from immaturity. Toddlers are unable to verbalize their strong emotions with clarity, so they express them physically, instead. They don’t yet have the impulse control to resist temptation or stop a tantrum quickly. So much of the terrible twos behavior we dread comes from immaturity. The other half comes from their non-stop earning. The first two years of life are packed with physical and cognitive development. During the toddler years, children are still developing physically, but they are also learning to be human. They are learning about cultural norms, how to use language properly, what is dangerous and what is safe, and how everything in the world works. The whole world is fascinating to a toddler. Everything that is normal to us (vacuums, doors, faucets) are brand new things to be discovered and figured out to them. If you stop and think for a second, you’ll probably realize that the ability to turn a knob and make water come out is pretty amazing. Just as they taught themselves to crawl, walk, and talk, they are now teaching themselves everything they need to know about the world around them. And that can be both exhilarating and exhausting (for them and you). The book that changed my perspective on the toddler years the most is The Danish Way of Parenting. Instead of seeing two-year-olds as difficult little people who are constantly trying to frustrate you, the author explained that Danish parents see them as curious little people who are testing boundaries. Your job as the parent is to set the boundaries and enforce them gently. You will need to enforce them more or less frequently, more or less strongly depending on how strong-willed your toddler is. Every parent will set different boundaries, but I’ve found that the fewer boundaries you can have (within safety and reason), the easier the terrible twos will be. I try to say “yes” far more often than I say “no” and save our few clear, strong boundaries for the behaviors that are physically dangerous, to the toddler himself, other people, or household objects. 4) Two-year-olds need our compassion. They want to be able to put on their own clothes, but they can’t. They want to be able to explain why they’re sad, but they can’t. They want to see how plugs work, but they can’t. They need to be heard over their siblings, but they can’t. Life is full of frustration when you’re two, so what our toddlers need most is compassion. They need us to put ourselves in their shoes and try to think about how life feels when you’re that small. Empathy goes a long way and will help diffuse any frustration and anger that comes up in you (I definitely struggle with this!). I don’t think that childproofing needs to be extreme. It does become far more difficult to childproof once you have older kids. But the more temptations and dangers you can eliminate, the less terrible the twos will be. Fewer problem areas in your home will mean fewer times saying “no” and reduce the number of tantrums you need to deal. Use outlet covers, put away products with dangerous chemicals, and store any trinkets you have for the year or so (at least the ones you care about!). I’ve dropped many other recommended childproofing methods simply because we have too many older kids in the house – I would be called to open the toilet and cabinets ALL.THE.TIME. It’s just not practical. But if you only have one or two kids, refrigerator locks and toilet locks will save your sanity. If you have more than one or two kids, sticking to a strict routine can be challenging. However, the more consistent you can be with naps and bedtime, the fewer behavior issues you will have to deal with. When we had just one or two kids, doing this was easy. Naptime and bedtime happened at about the same time every single day. It was beautiful. Trying to juggle a toddler that needs less sleep than most with big kids around all day has put our naptimes and bedtimes all over the map lately. You can definitely trust me when I say that consistency is best! I find that transitions are the most difficult time for my little guy. One of the ways we make this easier is so simple (when I remember to do it!). We say, “Good-bye,” to anything and everything when we need to leave a place my two-year-old clearly wants to stay. Just yesterday, we were at our local library for a Star Wars Fest. There was an awesome blow-up BB-8 figure, and my toddler LOVED it. As we were checking out, he continued to stand right by it, and I could tell from the look on his face that he did not want to leave that thing behind. By the look in his eyes, he might even be willing to stand his ground with a full-blown tantrum. Instead of freaking out prematurely, I walked over, took his hand, and said, “Say good-bye to BB-8! Good-bye, BB-8!” After a quick second, he happily said and wave good-bye and left the library of his own free will. No dragging. No kicking. No tears. Sometimes, just having words for how you’re feeling can make life easier, don’t you think? One way to help your toddler manage his big emotions is to give him words to define them. Eventually, he will start using feeling words accurately on his own. But the first half of the twos, you will need to help him. When we only had two kids, I took them to the park every single day. Sometimes, we would go twice a day. We all needed to get out of the house, stay busy, and have space to run around. As a stay at home, homeschooling, work at home mom of four kids (we also only have one car), we get out much less than we used to. That being said, over the past few weeks, I have intentionally worked more park time and neighborhood walks into our schedule to keep my two-year-old active. Every time we get out the door, he runs, and runs, and runs some more. I still marvel at how long that child can run – it seems like forever! When we make time to get out of the house, or I make time to direct his activities, he is a much happier and less defiant two-year-old. I no longer use spanking as a discipline method for any age or stage, but especially not my two-year-old. 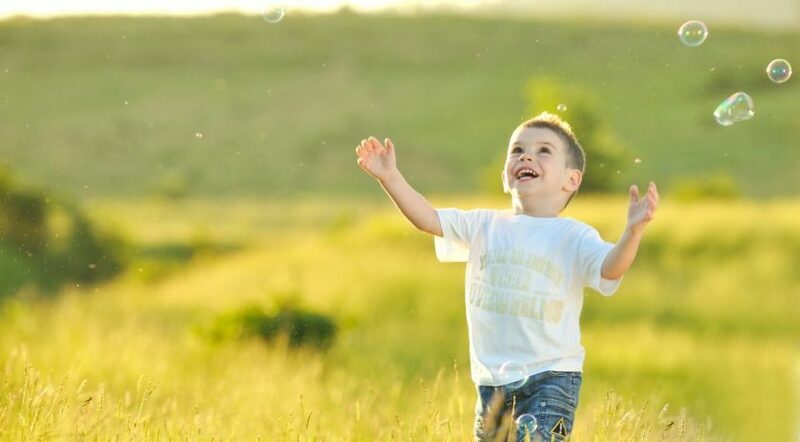 Because I believe that the majority of toddler behavior stems from exploration, curiosity, or immaturity, I use distraction and redirection frequently for unwanted behavior at this age. For example, if we are in the check-out line at the grocery store, and my two-year-old’s hands stray towards the candy, I will move the cart away from the candy and distract him with helping me put items from the cart to the belt. I also do not give a lot of commands at this age. I try to limit them to the most important situations, or when I am training him to listen to my voice and obey. Instead of telling him to come, I will often go to him or pick him up. Instead of telling him to stop across the room, I will go to him and move him out of harm’s way. By limiting the number of commands you give, you reduce the number of opportunities for disobedience and defiance during the terrible twos. For hitting, we remove the object used (if any), talk about how it hurt the other person, and occasionally require a “break” for 2 minutes in a chair in the kitchen. As your toddler grows, you can start using these simple phrases we use to handle the majority of misbehavior during the little years. I used to dread the terrible twos. I know now, four kids later, that kids don’t cuddle forever. They grow out of it. My big kids don’t want to sit in my lap for stories anymore. They barely fit, anyways. They don’t laugh with quite the same infectious giggle that toddlers do a hundred times a day. They don’t look at everything with quite the same sense of wonder and excitement. They don’t hold your cheeks to tell you they love you or stroke your arm in quite the same adoring way. My older kids barely let me hug and kiss them, let alone snuggle them for a few minutes. People frequently say that babies don’t keep, and I want to add that toddlers don’t keep, either. Don’t get me wrong: the twos can be exhausting, but this is also such a precious time in our lives, mamas. Soak up the sweet moments, brush off the bad ones, and love every minute because the terrible twos are actually pretty terrific. This was a beautiful post, and full of so much wisdom. Thank you so much for sharing. I am in a similar boat, this helps clarify what’s in my heart & experience. I also have twin toddlers (kids 5&6) and am homeschooling. They will be two later this year… so I love this 🙂 great guidance! And yes, outdoors! !